Since I am training for a new part-time job this coming week, and I need to get used to bringing a lunch to work again, I thought it would be advantageous to whip up a few quick recipes on Sunday afternoon that could last me an entire week. On Friday, I impulsively bought an entire carrot cake, thinking I could get 8 breakfasts out of it (hey, it’s high in Vitamin A), so I needed to come up with a fairly healthy lunch menu to counteract the richness of carrot cake with cream cheese frosting. 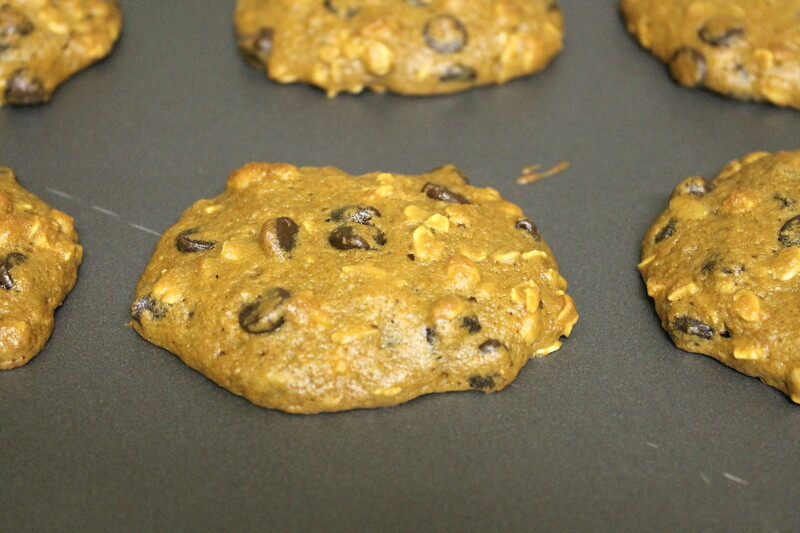 I ended up making a salad combining lentils, kidney beans, cannellini beans and olive tapenade and these cookies. 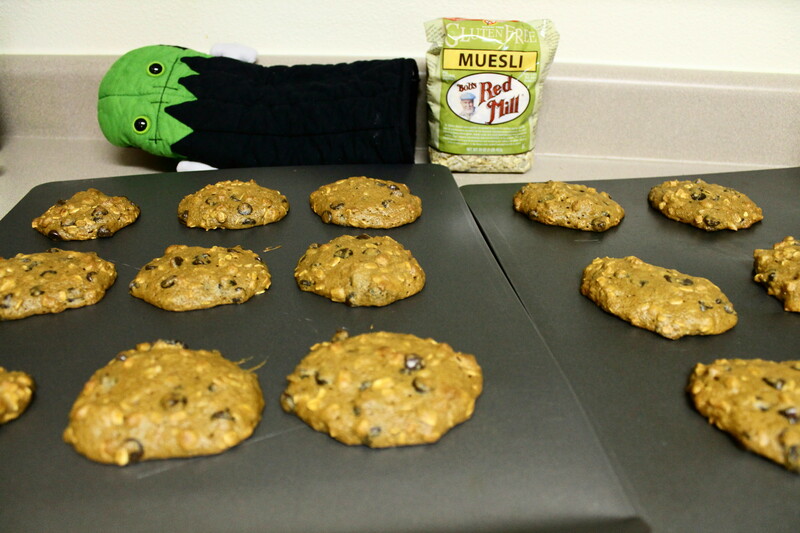 They’re based on this recipe from Bob’s Red Mill, although I made a few modifications and the cookies turned out well. I used unbleached white flour for a lighter cookie, substituted organic coconut palm sugar for the brown sugar and used Bob’s Red Mill Gluten Free Muesli rather than traditional muesli. Generally, I am a huge fan of gluten — especially in the form of bread or beer — but I find the gluten free muesli to be especially tasty. These cookies can be whipped up in about 20 minutes, including cooking time. Preheat oven to 375°F. In a medium bowl, combine flour, baking soda and salt and set aside. In a large bowl, combine applesauce, sugar and vanilla. Whisk in egg. Combine dry and wet ingredients in large bowl and mix well. Stir in muesli and chocolate chips. Spoon mixture onto lightly greased or non-stick cookie sheets. Bake for 10-12 minutes. Cool before serving. This entry was posted in Healthy Living, Recipes and tagged applesauce, cookies, dessert, healthy recipes, muesli. Bookmark the permalink.